We call the changes in hoof anatomy resulting from acute laminitis founder. We are concerned about founder because it disrupts the form and function of the hoof to some degree. 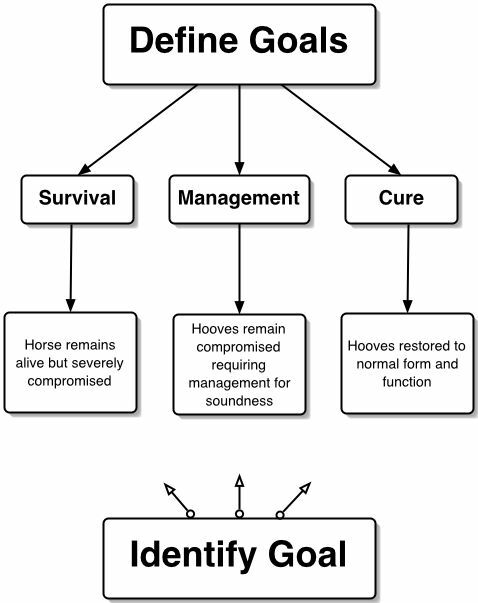 The ways in which these anatomical changes affect hoof physiology are predictable. There are three primary areas affected by founder. These are, from the top down, the coronary, lamellar and the solar regions. Changes in the coronary region affect hoof wall growth patterns. Changes in the lamellar region affect coffin bone stabillity. Changes in the solar region affect the ability of the sole to protect the sensitive structures within the hoof capsule. How a chosen therapy affects each of these regions will determine the quality of recovery. See note on prognosis. If cure is the desired goal select therapies that hold some promise of restoring normal anatomy and physiology to each of these regions.